At 31cm long, 23.5cm wide and 2cm deep this 12 cup bun tray is an excellent piece of bakeware to add to your existing collection. The great thing about this bun tray is that you can bake both sweet and savoury recipes in it. 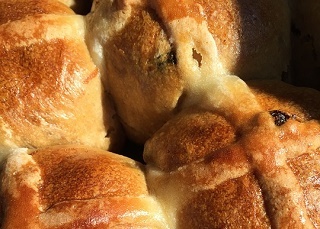 Take the delicious sweet buns listed below the main image for instance. Cupcakes would also work perfectly inside this 12 cup bun tray! These are fantastic examples of sweet dishes that can be baked in this tin. However you could also use it to bake a batch of Yorkshire puddings ready for your Sunday roast. There are 12 cups in this bun tray so you can ask the whole family round for Sunday lunch! Manufactured here in Britain, this high quality 12 cup baking tray has a double layer of non-stick finish which helps contribute to the 5 year guarantee that you can expect to benefit from.